Sadly, the later seasons lose a little of the magic, but it is a great, great show! Oh, and I do love Tim Riggins, too. A lot. Funny - T has always said we should watch this show because he's heard so many good things, but we were never around on Fridays and didn't want to add another show. However, ABC Family was playing it this weekend and we saw a couple, and it really was so good! OK, I just left you a comment and I don't know if it went through or not--so, if this is a repeat, I'm sorry!! Summary: I love FNL but had to remove mysef from the obsession because I get waaaaay too into TV shows. It reminds me of high school--I was a cheerleader and my high school sweetheart was a starter for varsit football. Feel free to gag now. And we dated through a year of college too! However, I married a too cool for school, hated football, hated cheerleaders, surfer boy! Ha! But, I do love that the show allows me to remember the "good ol days". Loved "Dazed and Confused!" Such a great film. From what I've seen of Friday Night Lights, it's a great show. Fans certainly have kept it alive. 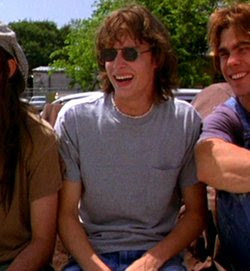 Love love Dazed and Confused! Even though you think I was like the bitchy one. HAHA?!? Thank goodness we didnt end up with our high school crushes. LEIGH- Um, you named yourself her! Ha- you could be with your crush right now, and going to Lord T and Eloise concerts at the Valirium with him, while he ingests some unknown white powder! Wouldn't that be great! Hee. I would be driving around in a VW bus talking about Buddha if I ended up with mine. Love this show too, perfect for the football record holding husband in my house, too! Oh yes, have to throw in a Go Gators this week. We had to cancel our trip to Knoxville, to move back into our house this weekend. But I still think we'll have a good showing! Love the show too and oh yes, Tim Riggins would have been my CRUSH for sure! hehe Heart the dazed and confused reference!! I so want to party at the moontower.